Please complete this short survey and to say “Thank You” we’ll give you a chance to get a $1000 Supermarket voucher! You’ve been personally selected to take part in our 2018 Annual Visitor Survey! 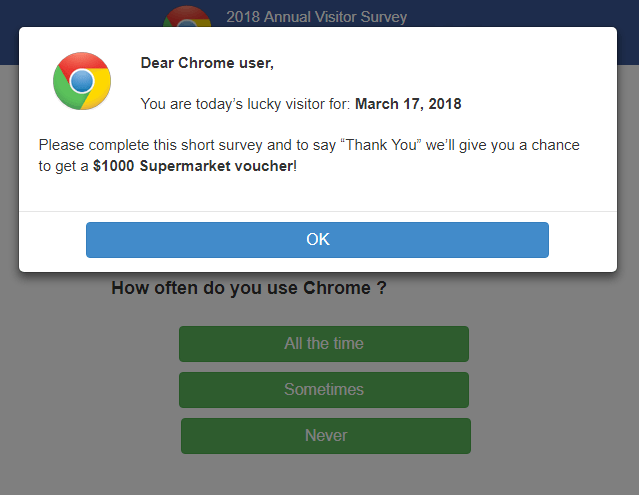 Tell us what you think of Chrome and to say “Thank You” you’ll receive a chance to get a $1000 Supermarket voucher! Please complete this short survey and to say “Thank You” we’ll give you a chance to win HD Streaming Movies®! You’ve been personally selected to take part in our 2015 Annual Visitor Survey! Tell us what you think of Chrome and to say “Thank You” you’ll receive a chance to win HD Streaming Movies®! How often do you use Chrome? Thank you for your participation, we have the following products today: Sunday, January 1, 2020. If you’re redirected to such a web pages to complete the survey or questionnaire, do not participate in any of them. Instead, you should just close and leave the web page immediately. Their purpose is to trick online users to provide individual information, complete questionnaires or surveys, purchase products or services by pretending to offer valuable rewards, which in actual are advertisements that require purchase and payment, delivering commission or incentive for scammers. In summary, the Annual Visitor Survey is a advertising disguised as fake survey or questionnaire with fake rewards that is delivered via malicious way, that is you’re forced to the website unwittingly, hoping that you will do some purchases. While the website itself is unlikely to be doing any harmful or malicious activity on your computer, but getting redirected to the web page is annoying and potentially dangerous if you have giving out your bank details and/or credit card information. So it’s important to clean and remove the trace of “Annual Visitor Survey” malware from the computer. The stubborn malware cannot be easily removed by anti-virus or anti-malware security software. In the Chrome web browser, open the Customize and control Google Chrome Menu -> Settings. Expand the Advanced at the bottom. Under “Privacy and security” section, hit Clear browsing data. 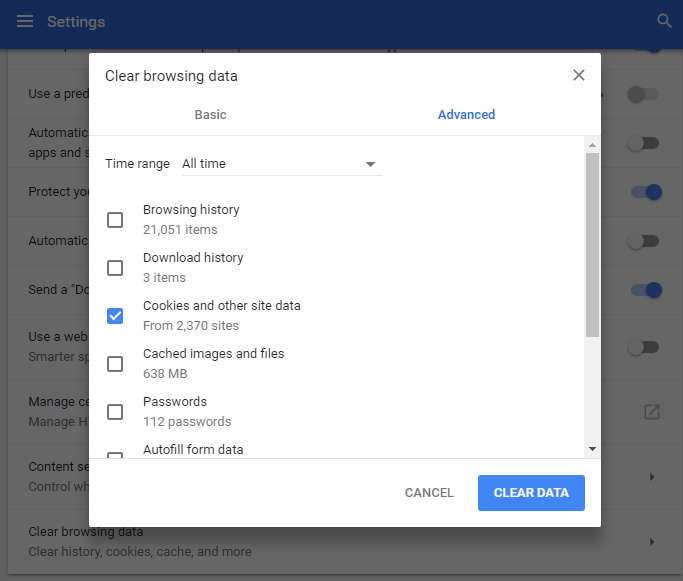 Select at least the Cookies and other site data (you can select other options as you wish) and then hit the CLEAR DATA button. The step should remove all the components that cause the YYYY Annual Visitor Survey redirection. The redirection to Annual Visitor Survey should stop once and for all.